The LRM (Loiterers Resistance Movement) is a Manchester based collective of artists, activists and urban wanderers interested in psychogeography, public space and the hidden stories of the city. 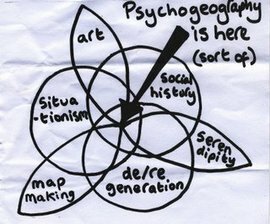 We can’t agree on what psychogeography means but we all like plants growing out of the side of buildings, looking at things from new angles, radical history, drinking tea and getting lost; having fun and feeling like a tourist in your home town. Gentrification, advertising and blandness make us sad. We believe there is magick in the mancunian rain. Our city is wonderful and made for more than shopping. The streets belong to everyone and we want to reclaim them for play and revolutionary fun…. The LRM embark on psychogeographical drifts to decode the palimpsest of the streets, uncover hidden histories and discover the extraordinary in the mundane. We aim to nurture an awareness of everyday space, (re)engaging with, (re)mapping and (re)enchanting the city. On the first Sunday of every month we go for a wander of some sort and we also organise occasional festivals, exhibitions, shows, spectacles, silliness and other random shenanigans. These range from giant cake maps to games of CCTV Bingo. In 2016 we are celebrating 10 years of creative mischief with an exhibition at The Peoples History Museum. Loitering With Intent: The Art and Politics of Walking. It opens on July 23rd and features new and archive material from members of The LRM and others inspired by our work. Please walk with us; everyone is welcome. Our events are free and open to all: these are our streets and they are yours too. This website is still under development so please excuse the gaps in content. I drew this Venn diagram on the back of an envelope when I was trying to explain why I thought the derive could be a wonderful tool. Although it misses out the multi-sensory experience of walking I still think its a good starting point. Plus, its a sort of map and maps can be beautiful. They are also powerful and I think we need to create our own DIY cartography that represents how we want space to be.